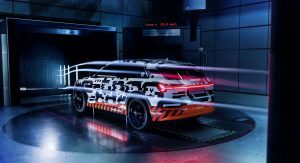 Audi has been testing vigorously the fully electric E-Tron SUV at their wind tunnel, clocking more than 1,000 hours on the test rig in order to ensure the best possible aerodynamics of their first series-production EV. 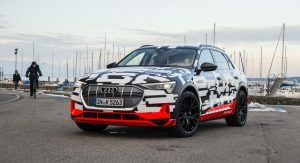 The result is an impressive drag coefficient of 0.28, helping the upcoming Audi E-Tron achieve an everyday range of more than 248 miles (400km) in the latest WLTP cycle. 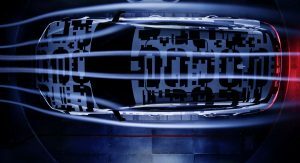 Aerodynamics is key to an electric car’s performance, with the E-Tron featuring advanced technical solutions to help it glide through the air with the minimum resistance. 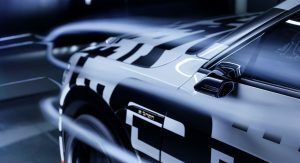 Among these solutions will be the optional virtual exterior mirrors, a world-first for a series-production car. The virtual door mirrors are much narrower than standard mirrors and have a small camera integrated to them. The E-Tron’s width is reduced by 15cm when fitted with them and the captured images appear on OLED displays mounted in the transition between the instrument panel and the door. There are three views available: for motorway driving, turning and parking. 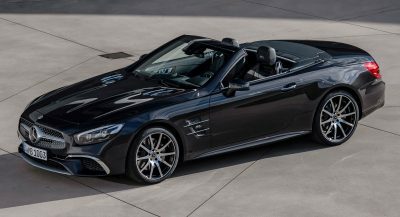 Other measures include a fully enclosed underbody, with the front and rear being fully panelled. An aluminum plate protects the battery pack against damage from below, with its bolting points featuring bowl-shaped indentations, similar to the dimples of a golf ball. The E-Tron’s underbody dimples make the air flow much better than a totally flat surface. 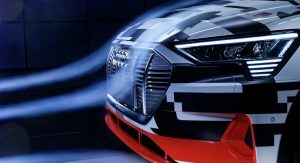 In addition, Audi has fitted the E-Tron with an active grille that has two electrically operated louvers. 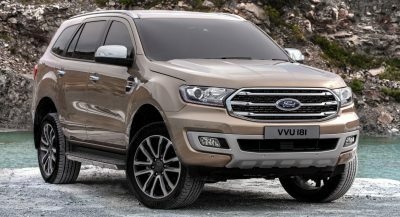 When open, the active grille can cool drivetrain components, provide ventilation to the air-conditioning condenser and even channel air into the front wheel arches to the brakes via a pair of ducts. 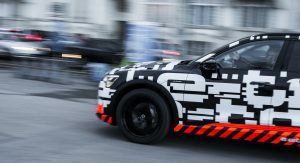 The Audi E-Tron will be unveiled on August 30th and will go on sale in Europe before the end of the year. 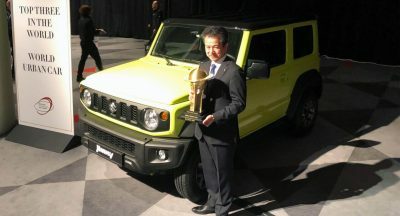 I assume the door mirrors will never make it to US market? 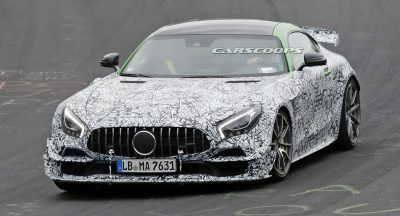 I would agree–at least until more manufacturers push for the benefits of better aero and smaller blind spots. I am actually surprised that they are as big as they are, considering the quality of camera that we can package into smartphone these days. Indeed. And also: is the placement really optimal for cameras? Or is it just a way of being able to replace the normal mirrors with cameras as an added option without changing the general layout. There’s a patch of road you must be able to see down the side of the car. Of course, but when the actual contraption doesn’t have block your field of view, there are a lot of placement opportunities to be explored. Yes, there are, as long as you get a view down the side of the car. Your camera smartphone doesn’t have to be able to operate in -30c or + 50c temperatures or be hung out the side of a car at 200kmh and perform when a following car’s headlights are pointing straight at it or even a setting sun. The camera package is rather small, it just needs things like a robust connector and shroud to cancel out stray light. The housing may even need to fold away. For sure not considering our regulators don’t have a clue on tech. We are deprived, can’t even have matrix lights. It will be years before we get any good tech, unless we get these retards on board with modern tech like the rest of the world. Who cares? Launch the damned thing already! 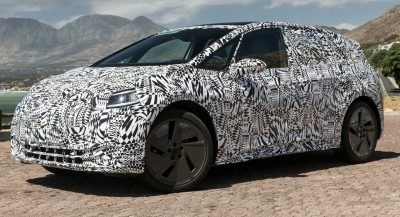 So if they call this CUV e-tron, what if they decide to make another all-electric model? 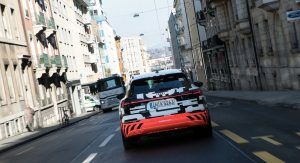 A4 e-tron? or f-tron, Q8 e-tron? 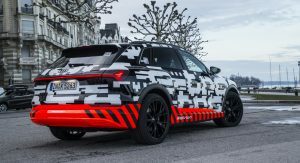 So this will be “the e-tron” like the original Quattro is the “Quattro”?